Two of the twelve fields surveyed had very large infestations on the field margins, with 95+% of the stems cut in the first 50 to 100 feet from the field edge. 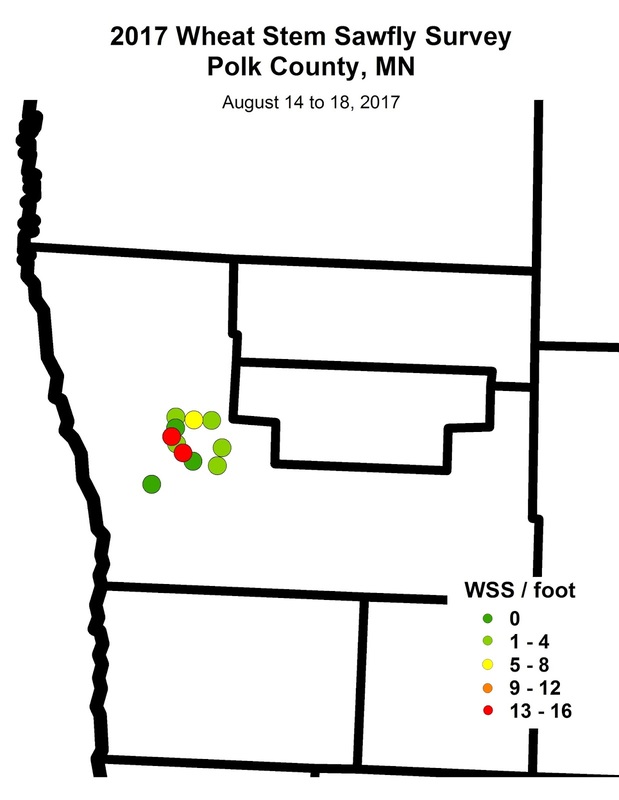 In these cases, the edges impacted were those closest to 2016 wheat fields. As we moved away from the most heavily infested fields, the infested stem level declined. If you observe high numbers beyond where we have scouted so far, drop us a note with GPS coordinates or legal description and we will take a look. Visual inspection by the combine driver, combined with yield monitor data should help pinpoint if and where sawfly infestations were present. Make note of this information to assist with targeted tillage and rotational plans. 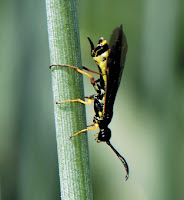 If lodging is seen in a field, check to see if it is due to sawfly cutting, weather, or both. 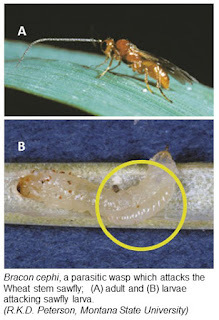 Tillage reduces wheat stem sawfly survival. Most recommendations have suggested shallow tillage after harvest to lift the infested stubble and loosen the soil from around the crowns. This maximizes the larvae’s exposure to the late summer dryness and winter cold, increasing mortality. More aggressive tillage that buries the standing stubble completely will also reduce sawfly survival. In the short term, with the limited area of the infestation, we believe a strategy of aggressive tillage using a mold board plow in the field margins where infested stubble is concentrated will have a more immediate effect at bringing populations down. 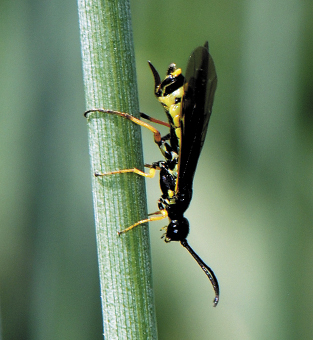 In Colorado, no-till has been associated with recent wheat stem sawfly problems. However, the advantages of controlling the sawfly with tillage should be weighed against the considerable benefits of reduced tillage. This is the reason to limit using a mold board plow to only heavily infested borders. 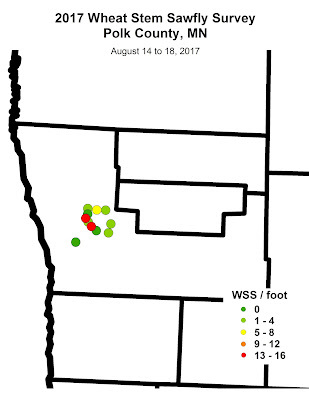 In areas where the insect pest is historically more persistent (e.g., western Dakotas, Montana, Colorado and others), reducing tillage promotes the survival of the two parasitic wasps, Bracon cephi (see figure to right) and B. lissogaster. The sawfly larva is paralyzed and killed by the parasite larva, preventing feeding injury and stem cutting by the killed WSS larva. Conservation of these control agents would be beneficial. 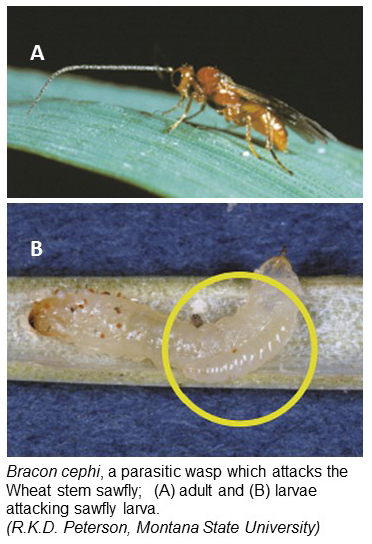 For more information on Wheat Stem Sawfly biology and management, North Dakota State University has a current publication available.